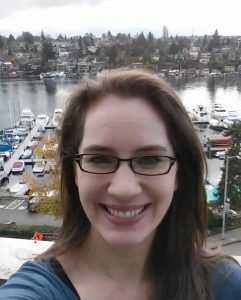 This post is written by UW postdoc Elyse Hope. There is a lot of genetic complexity that can contribute to what an organism looks like. Far from a single gene controlling a single trait (e.g. a gene for height or eye color), many traits are determined by the contributions of hundreds of individual genes acting in a variety of pathways. Trying to figure out what genes are involved is a hard problem, but important to pursue using both classic and novel methods because the majority of important traits across all organisms are complex. On the front lines of agricultural research, geneticists are working to better understand complex traits like drought tolerance, pest resistance, and root depth that will assist in intelligent breeding and genetic engineering decisions in response to climate change. In the microscopic world, bacteria and other microbes exhibit a variety of complex traits that enable them to colonize new nutrient sources and resist harmful chemical treatments, contributing to pathogenicity and the development of drug resistance. It is in this microscopic world that I do my work, adapting the methods in the Dunham Lab to ask how a complex trait evolves. 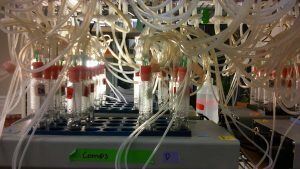 In Maitreya Dunham’s lab at the University of Washington in Seattle we investigate (among many topics) how the single-celled microbe yeast evolves in real time. The yeast we use is the same species that is used to make beer and bread and as such is not typically considered a pathogen itself, but we can use it as a model system to ask questions about yeast in general. Most of our questions have to do with how yeast cells respond (at the level of both their genomes and their phenotypes, or what they look like) to selective pressures, particularly limitation of an essential nutrient. The system that we use to ask these questions is a device called a continuous culture chemostat, which is a small glass growth chamber that allows the microbes to grow at steady state (Figure 1, multiplexed chemostats), adapting only to the selective pressure we’ve chosen — or at least that’s the idea. Just before I arrived in the lab, another graduate student conducted 95 of these small evolution experiments under three different nutrient limitations and found that about 35% were also demonstrating an adaptation to the physical constraints of the growth chamber itself. 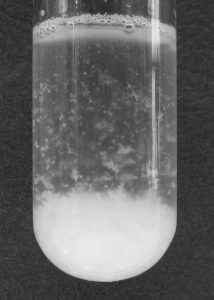 They evolved a trait in which the cells formed big clumps while growing in the chemostat — big enough to be visible to the naked eye, which is an accomplishment for cells as small as yeast (Figure 2, cells clumping in liquid culture). This trait increases how long the yeast is able to remain in the growth chamber without being diluted out, which gives them a different type of adaptive advantage. It’s also a nuisance in our experiments (the “lemon” of my title), because it confounds the selective pressure from the nutrient limitation. A well-known credo in biology is “you get what you screen for” (Frances Arnold, Trends in Biotechnology, 1999). While we were screening for responsiveness to the nutrient limitation, we were also screening for responsiveness to the growth environment itself. This collection of clumping strains gave us a unique opportunity to make lemonade and ask questions about the clumping trait instead, like which genes contribute to clumping and how often we see mutations in the same genes. These were the primary questions I explored in our most recent paper, available on bioRxiv while it is in review. Clumping, or “flocculation” as it’s technically called, is a known complex trait with many genetic contributors, and has shared features and genetics with other traits related to biofilm formation, which have hundreds of known contributing genes. What would we find in the 23 clones we selected to study? Would there be too many contributing mutations for us to resolve? Would each clone harbor a different causal mutation, or would they all be in the same gene or acting on the same gene? (Figure 3, possible routes to flocculation) I want to step back for a moment and say that this project was a geneticist’s dream. We had a remarkable puzzle to solve, of unknown complexity, and the entire toolkit of classic yeast genetics and modern genomics techniques at our disposal. We also had no idea what we would find at the end, but we knew it would be interesting and possibly quite useful. The project also even had components, like the Bulk Segregant experiment I’ll describe below, that were suitable teaching tools, and some of the experiments and analyses were conducted as part of the Yeast Genetics & Genomics course at Cold Spring Harbor in the summers of 2014-2016. We started our search for the causal mutations using Whole Genome Sequencing, comparing the genome sequence of the evolved flocculent clones to the sequence of the ancestral yeast strain from which they evolved. We detected many mutations per clone this way, and only some of those were in candidate genes we expected might be involved in flocculation based on the literature. To narrow it down to which mutations were actually causing the flocculation, we employed a classic yeast genetics technique called Bulk Segregant Analysis, which uses yeast crosses to follow which mutation co-segregates with a trait (e.g. flocculation/clumping). By examining co-segregation patterns for the mutations we identified in our sequencing data, we were ultimately able to identify the causal mutations in all of our clones. At first, we thought there were a few different mechanisms at work. We found a common mutation affecting the regulation of a known flocculation gene called FLO1 in over half of our clones, but the rest seemed to have a mix of different mutations. 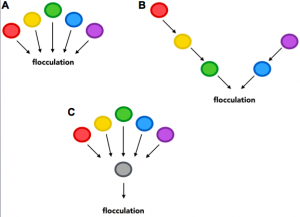 When we got further into the literature about flocculation, however, we discovered that almost all of the mutations we found were in genes that also had something to do with the regulation of FLO1. This could have gone very differently. Since we started this work by agnostically asking how many different adaptive routes lead to flocculation, we could have gotten 23 different answers. Instead, we got one primary route. Because of this outcome, we could take the work a step further: if we deleted this causal gene, would the yeast evolve flocculation more slowly? Our final experiment evolving many replicates of a strain with FLO1 deleted revealed that this single deletion reduced flocculation occurrences to 3%, and demonstrated the efficacy of using experimental evolution as a tool to identify and eliminate the primary adaptive routes for undesirable traits. This work applied experimental evolution to better understand a complex trait — but for me, flocculation isn’t just any complex trait. It’s a useful trait, the genetics of which is incredibly important to understand. Flocculation is one of several traits associated with biofilm formation, a community-building trait that is a key contributor to brewing but a nuisance in other industrial processes and in laboratory and clinical settings. Pathogenic yeast that live in such protective communities are harder to kill with antimicrobial agents, and industrial yeast that clump are easier to filter without expensive machinery or chemical treatments. I’m hopeful that the evolution-and-engineering approach we took will enable us and others to better serve the needs of the medical, academic, and industrial communities who face biofilm-related issues daily. The approach underlying this work also exemplifies the main reasons I chose not just my graduate lab but also my graduate department. Both understand that classic genetics techniques and modern genomics techniques can answer a lot of questions on their own, but combined they can do even more. I think scientific endeavors are most successful when they are rooted in both the contributions of the past and of the present, and I’m pleased that we had an opportunity to showcase how well that can work with these experiments. This entry was posted in BEACON Researchers at Work and tagged BEACON Researchers at Work, experimental evolution, genomics. Bookmark the permalink.